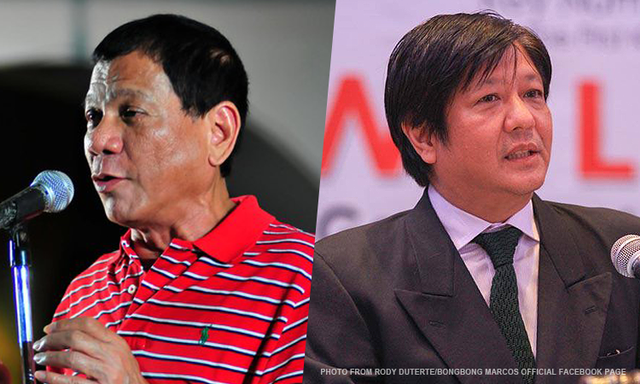 Davao City Mayor Rodrigo Duterte and Senator Bongbong Marcos are still leading the presidential and vice presidential online surveys being conducted here at SouthCotabatoNews.Com. As of 3 AM April 15, the presidential poll already has a total of 4,188 votes while the vice presidential poll garnered a total of 2,281 votes. If elections are held today, who would you vote for? Duterte of PDP-Laban was chosen by 74 percent of the respondents or 3,113 votes. He was followed by Vice President Jejomar Binay with 8 percent or 345 votes; Sen. Miriam Defensor-Santiago, 7 percent or 295 votes; former Interior secretary Mar Roxas with 6 percent or 259 votes; and Sen. Grace Poe, 4 percent or 176 votes. On April 9, an estimated 20,000 people attended the grand rally of Duterte in the City of Koronadal. It was the most attended political event in the history of Koronadal as described by some residents. The camp of Duterte said the online survey result and the number of people who gathered during the rally was a “great surprise”, noting that majority of local officials in South Cotabato are supporting Mar Roxas, the standard bearer of the ruling Liberal Party (LP). "It just showed that the people here, just like in many places in the country wanted a change in government, and they believe in what Mayor Duterte can do.." said one of the respondents in the online survey. Meanwhile, Ferdinand “Bongbong” Marcos Jr. topped the vice presidential online poll with 957 votes or 41 percent. Senator Alan Peter Cayetano placed second with 812 votes or 35 percent followed by Sen. Chiz Escudero with 298 votes or 13 percent. In fourth place was Congresswoman Leni Robredo with 187 votes or 8 percent. Senators Antonio Trillanes and Gregorio Honasan trailed far behind with 18 votes and 9 votes, respectively.